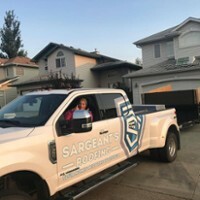 15 Years Ago Joe Sargeant started his career working in the roofing industry beside a set of industry outsiders who focused on a set of simple principles. 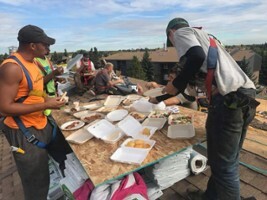 Great Craftsmanship, on roofs that are completed in a day, with zero subcontracted workers, only hourly employed people who have no reason to take a shortcut. 10 years later that company went from a handful of guys working side by side with the owners, to being sold as they retired. As the culture there changed with new ownership - Joe wanted that atmosphere of standards and expectations back. 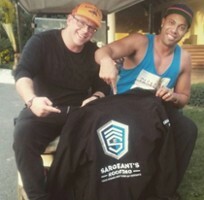 So he forged his own path with a best friend now business partner, and start up Sargeant's Roofing. Not forgetting the principles that made his teachers, mentors, and former bosses successful, and their customers happy and loyal for the long term. 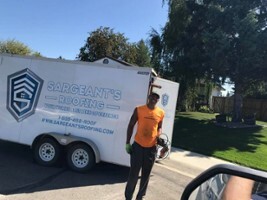 Now Sargeant's Roofing is synonymous with Quality Work, Fair Pricing, Integrity and Happy Customers! We focus on teaching first, selling second. The owners quote the roofs, are present for the installation of the roofs, and collect payment at the end - only once you are 100% satisfied. That way timely communication and consistent work product delivery are something we can promise every time! 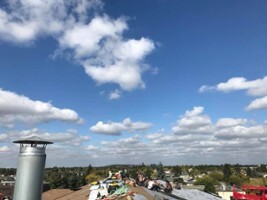 20% off roof replacements (Asphalt or Cedar Only). Not to be combined with any other offer or promotion. Rubber Roofs - Military Grade Strength for your Roof! Team Photos - Get to Know Us! 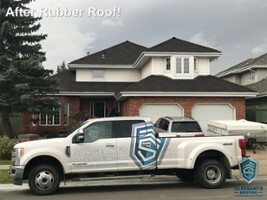 Read this First -- There is no better way to understand why Rubber Roofing is the best kind of material for your home. Rubber Roofs also look right at home in older areas with classic architecture and mature landscaping. 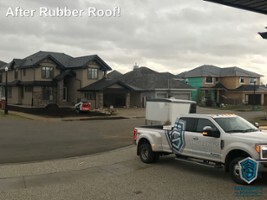 The best part is its manufactured in Canada, using recycled rubber from Alberta Landfills that is treated for lifetime reliability, before being placed on your home with Care by Sargeants Roofing! Many new homes in high-end neighbourhoods are being built to Spec with Rubber Roofs. Permanent Roofs are a great investment. Rubber roofs are not only permanent as a roofing material but they are also permanent in their aesthetics. Over time they do not fade like Cedar. They do not dent ding or warp like metal. They do not wash off like Asphalt. They are a great alternative for anyone looking for a long-term roofing material for their next home or roof replacement. 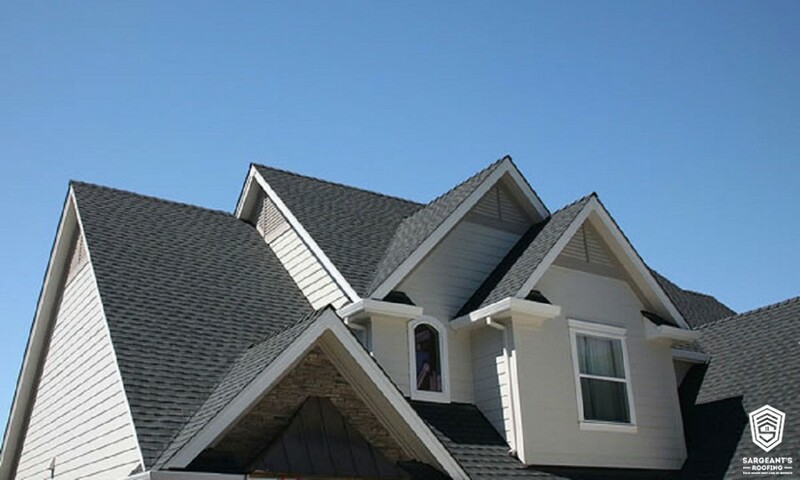 This is a roofing material that both looks great and protects your investment. Because it does not need to be replaced for 50-70 years. The cost of replacing the roof does not need to be factored in when you sell the home in 15-25 years. As inflation goes, the roof becomes worth more over time! The smart Money goes with Rubber EVERY TIME! This European Slate mold looks great on modern Luxury Homes! Unlike Cedar Roofs - Rubber does not change colour with Age. What you pay for is what you get, with the BEST warranty available. Meaning it is not a pro-rated warranty where you get less coverage as the time passes. 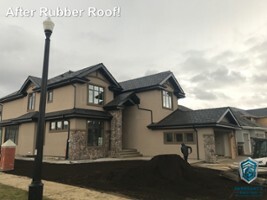 Rubber is a naturally waterproof, hail proof architectural roof material the looks great and lasts longer than anything. Read This FIRST! It will make the rest of the pictures make a lot more sense. 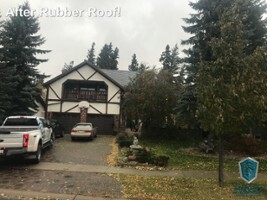 By simply looking at the roof from the driveway you wouldn't notice all that is wrong with this roof from the other pictures would you? Now comes the easy part... installing the cedar shakes. We prefer HAND SPLIT shakes, not tapersawns. This means one side of the shake is split with the grain of the wood. It gives it a rougher more uneven shape. Each piece is unique but meets a certain minimum grade of quality. The grain of the wood has oils that prevent water penetration. Tapersawn wood has all the cut fibers that actually slow down the water flow off of each shake. If you take a piece of each and run a tap over them. You will see the difference. Valleys are CUT AWAY from the roof and placed. Not cut in the valley. It is much faster to place the wood then cut up the valley with a skilsaw - however one little nick and you have a valley with a cut in it. Sargeants Roofing also ONLY uses W metal valleys. Note the grey metal in the center, has a bend in the middle to reduce the "Sloshing" of water back and forth as it goes down towards the troughs. This acts like a break from the water coming in from each side. Between each row of cedar there are layers of shake felt applied to prevent water from getting under one shake and into the roof on the lower row. Prior to laying out the underlayment the boards need to be laid out and cut to measure. Otherwise if you lay the boards down there will be trimming needing to be done and you never want to take a saw to the board once it is installed on the roof deck. What do you think will hold in nails more securely? Sawdust and glue? Or these much more dense boards? This is what makes a cedar roof last years longer. Its a much more labour intensive project but it results in a much better roof. 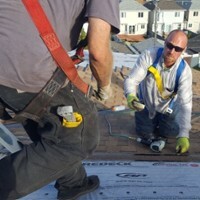 First we prep the roof deck with a synthetic underlayment and install horizontal sheathing. This would be considered a minimum. For some applications we will install vertical runners underneath those. That run up and down the roof. This allows cool air to get under at the base of the roof. The synthetic underlayment under the horizontal boards is also optional. The idea is that we want to give each row of cedar shakes a solid piece of wood to be nailed into. This prevents any movement in the cedar and allows air flow under neath. CEDAR NEEDS TO BREATHE! More examples of nails working their way out of the wood. 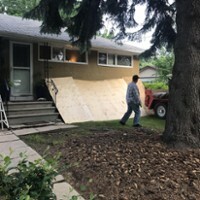 Installing Cedar directly onto plywood is WRONG. Plywood is sawdust and glue... it does not hold the nails in. As you can see here. Once this premature wear and tear starts and wood debris collects in the valleys. Water cannot drain effectively off the roof which caused moisture damage around this chimney. See how the nails are coming out? What happens is the weight of snow and ice pushes the wood down, but not the nails. Freezes around the nail, and as it melts it pushes the nails back out of the roof. This would not happen if it was nailed into something solid! Note the severe age of this roof? 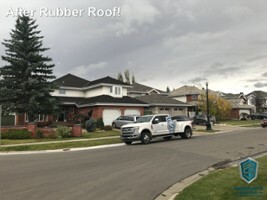 This is VERY common for roofs in Wedgewood, Edmonton to have problems and leaks within 20 years. This SHOULD NOT HAPPEN! 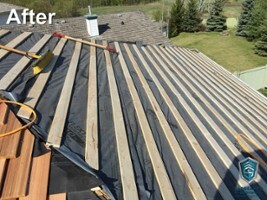 Moisture gets into the wood, freezes, splits the wood and causes all kinds of potential for leaks and early shingle wear. Not to mention it looks bad! Beths first time Backing up "Iggy" the dump truck. First try, and she had no guidance. Pretty impressive. Behind the Scenes Adam and our accountant affectionately known as "Mamma Bear" making sure the books stay tight and that we get all our customers their warranties and invoice paperwork. And that our people get paid on time!! Thats most important haha! 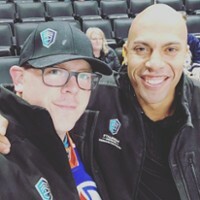 Joe and Adams FIRST ever hockey game together 2017. Thanks to BP Canada - our favourite shingle company for giving us the tickets! Was a great experience. Adam and Joes first Vacation in 3 years! Super thankful to the roofing team, and our customers for granting us this privilege! 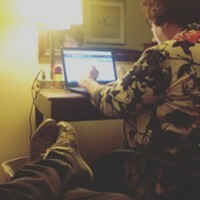 Joe finishing his last estimate - getting dark outside. Because every estimate comes with a full complimentary roof inspection. 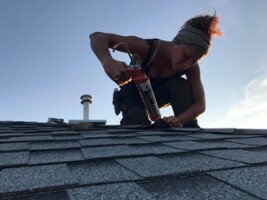 It takes us a good hour to quote a roof. This ensures the price will never go up or change mid job. Because we know what is going on with every aspect of your roof and take lots of notes. Bob is the foreman and his first task every day is to make sure that we don't wreck anyones flower beds. This is his trademark flower bed protector wall. haha! Joe and Adam hooking onto the trailers super early in the morning! 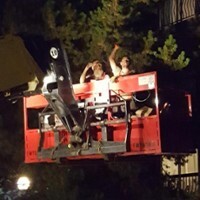 Big Thanks to Tyler and Christian - last ones off the roof the last day on a big 7 day apartment job where we worked late into the night taking down the work site. Yes, christians face really is that dirty! Nice action shot of Uncle Bobby catching a coil of nails from Christian. Beth ready to start the day! Tear Shovel in hand. 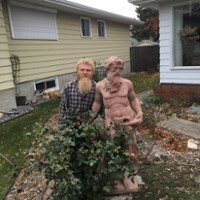 The Home owners were so happy with Tylers work ethic they put up a statue in his honour! 4 years and she has a new roof and finally no leaking sky lights! 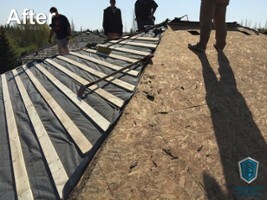 Proud to have installed this Leaky Church Roof! Sargeant's Roofing first big commercial job! 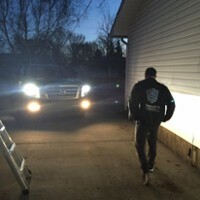 We take pride in the fact that its the owner estimating the roof, the owner installing the roof, and the owner shaking the hand after final payment! One of our First Clients Wayne Eng -- check out those old signs! They weren't pretty but they worked!! 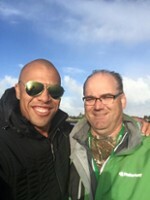 Another shot of Joes invitation trip to Malarkey Shingle Manufacturing plant and fishing Trip. 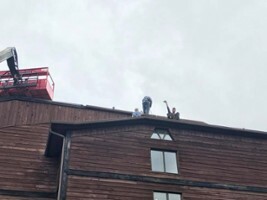 Lucky guy actually got to not be on a roof for once! 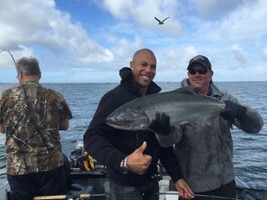 We are also Certified installers for Malarkey - this is the time they flew Joe down to the states to go Fishing... lucky guy. Joe looks happy to be putting the tools away after a hard day! 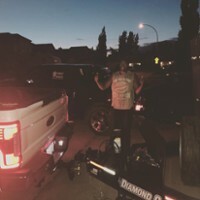 That time Beth made Adam look bad and parked the massive Dually and Trailer in the customers driveway first try with no direction. GREAT JOB BETH! We love working together and try to make it a fun positive experience. These customers were awesome and made us lunch! Joe Godfrey Beth and Andrew really appreciate it! Joe and Godfrey got some nice shots taken by our customer with a great camera and good skills. Very nice. Beth is the SMALLEST person on the team and second in speed only to the towering 6'6" Joe Sargeant. 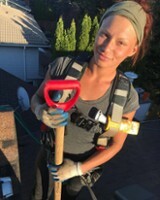 We call her Beast Mode Beth... but she's also great at roof repairs. This is her fixing a piece of cap that blew off. 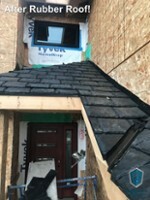 We will install any shingle brand you want. BUT... we can tell you a number of reasons why BP is your best choice. Starting with Locally Manufactured. 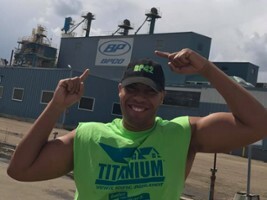 This is Joe outside the plant during the research and testing phase of BP's new shingle design. When BP Canada released their new shingle design. We were one of 3 contractors called on to install the first run out of the factory, and give our opinion. 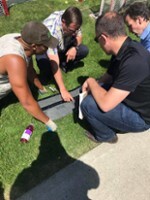 Here we have the General manger of our distributor, our local rep, and the BP Manufacturers scientific team all discussing the shingle with Joe. 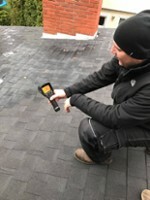 Steve from Admirable Inspections showing us the location of moisture for a roof repair that was challenging to fix. We don't give up. Ever. Admirable Inspections preferred Roofing Contractor. When he finds problems for homes being inspected for sale. We come fix them. 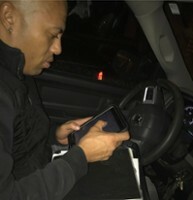 We also use Admirable to help us diagnose problems with his fancy infrared cameras so when we say its leak free its a Scientifically Proven FACT. Our friends at LA Nissan in leduc let us borrow a Titan XD and the staff loved the cooler boxes in the truck bed. Nothing like cold energy drinks after a hot day on the roof. Beth - Uncle Bobby the Foreman and Joe Sargeant all doing a poster run. 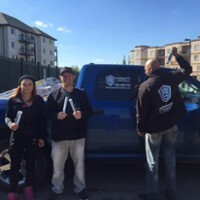 It's a team effort to get the word out to our potential customers. Teach First, Sell Second! Christian Always likes to say Hello as people pass by! 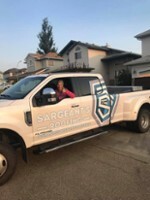 53.510664 -113.672353 Sargeant's Roofing Ltd. Sargeant's Roofing Ltd.
24-7 Call us any time! Guaranteed 2 hour response time. 5 minutes usually!